Antarctica is experiencing renewed interest with the latest Attenborough documentary 'Frozen Planet' currently screening on TV. Extraordinary landscapes and wildlife abound - one of the continent's beaches boasts the greatest mass of animals on the planet. The nearby remote sub Antarctic island of South Georgia also has a rich wildlife biodiversity, with over 1,500 recorded species, many found nowhere else on earth. 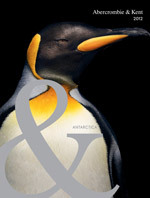 Celebrating 100 years since the first Antarctic expedition, global travel company Abercrombie & Kent releases its new 'Antarctica' brochure. Experts in expeditionary cruising to the White Continent, the brochure marks A&K's 21st year of operation there with an extraordinary tally of over 150 journeys. See why a voyage to Antarctica is the trip of a lifetime.